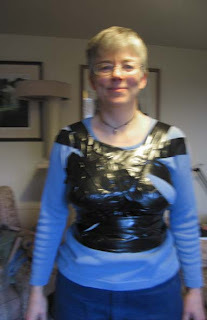 Fun with duct tape | carpe diem! I wonder who will be deeply disappointed when Google offers them this? Best not to know. Now, if I’d just thought to have a couple of empty wine bottles in the frame… but the recycling was collected that morning 🙂 They are seriously weird things, though. Much more humanoid in their imperfections than a dressmaker’s dummy will ever be. 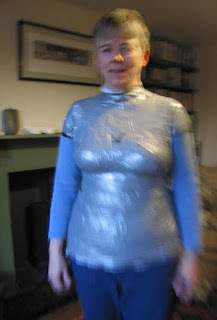 Joanne asked whether the duct tape dummy can be amended? stretched/allowed to shrink? to match changes in the original; I’d guess not. They’re flexible, but not in that way. The flexibility is one of the weirdnesses. Lots of websites have illustrated instructions; here’s one describing several different methods to make what looks far more professional than mine, here’s the one that inspired my efforts, and here’s a use for any you no longer need. In short, you start by finding a couple of old t-shirts (one to wear, one to cut to add length and a neck) and buying some duct tape. Two large rolls (20m) are ample. I wasn’t certain whether our local DIY builder’s merchant’s ‘cloth tape’ was the right stuff, so asked one of the counter staff if this (brandishing roll) was duct tape aka gaffer’s tape. He said he didn’t know those names, but it was the stuff that sticks to everything. I decided NOT to describe the intended use. Be sure you’re wearing a bra that supports you as you wish to be remembered. If you don’t need a bra, I HATE you. Start with strips that ‘lift and separate’ realistically, and some to define the under-bust neatly. 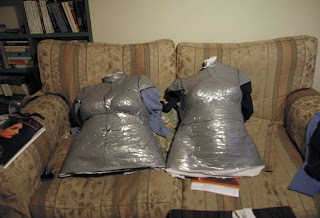 Then just wrap, snugly but not too tight. 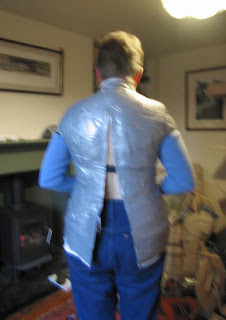 We took care to have at least two layers of tape everywhere, and up to four on places that were likely to see some wear such as the bottom (you know, hem area) of the dummy. I got done first and at this point neither of us could stop laughing. I just wish the other rolls had been black, too. The wrapping took about 45 minutes. When finished, mark centre front, armscyes and centre back with indelible marker (M’s suggestion), then cut up the back with sharp scissors taking care not to cut the bra strap. There’s a strange sense of relief when you’re released, but the support provided by the taping is quite pleasant. I didn’t find it too hot in there, but it was a cold day. I posted the other photo first so you KNOW the dummy is splayed open at the back. My hips are not that wide! Note that M also marked the finish point for the v-necks I should be wearing. Then I did hers, which is now named ‘Jane’. Then I was asked to demonstrate how a spinning wheel works. M avows no desire to spin (and I believe her), but wanted to understand the mechanism, so after a brief explanation I left her with fibre and wheel and went to see what dinner was doing. 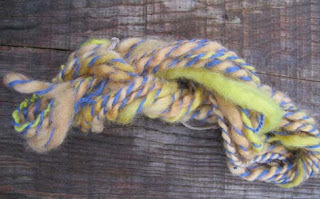 End result: her first-ever handspun (yellow), which she plied with some of my first wheelspun (blue). I brought out Barbara Albright’s ‘The Natural Knitter‘, which has been favourably reviewed on several blogs by people saying most of the patterns are eminently knittable (I want the Nora Gaughan’ ‘Architectural Rib’ sweater. how can I resist the name, let alone the cables? ), and ‘Norsk Strikkedesign‘, which contains several patterns that make my fingers twitch almost uncontrollably as I imagine the fair isling. M commented that ganseys, jerseys, arans and fair isle are too 70s, too rectangular to be flattering to any normal person, and too heavy to be worn for anything except a brisk walk on a cold day. You know what? She’s right. What I realised is that I DON’T CARE. I hadn’t really thought this through, but I knit most stuff because I want to make it, in the same way that a sculptor wants to create a sculpture or a musician wants to make music. I want to knit cables and fair isle because I want a challenge, and because I think the end result is a work of art beautiful in itself. And I will wear the garment not because I think I look good in it, but because I think the garment is worth looking at in its own right as a work of art and I’m proud (oh, how I hope I am) of it. I must remember that I make this peculiar distinction between art and clothing-that-fits, and that I need/want both. And to bear it in mind when, as one does, I see someone wearing a hand-knit that does absolutely nothing (or even worse) for them as fashion or clothing. We talked of the ways in which aran or fair isle patterning could be shaped for more attractive fittings and the problems therewith; I wish I’d thought to show her Rogue, in which the designer changes the flow of cables to provide waist shaping. The only patterns that she thought were both interesting and wearable, some even desirable, were in my copy of Jamieson’s of Shetland ‘Simply Shetland 3‘ which contains some intriguingly constructed elegant sweaters, jackets and capes as well as the more traditional fair isle. This entry was posted in Uncategorized on March 31, 2007 by sarahw. What a fascinating idea! I’m very interested in your approach! There are some new books coming out, especially Stefanie Japel’s Fitted Knits, that address the need for knitted beauty and fit. Worth looking into, I think.On thing–I’d shrink the Rowan Indigo before knitting it up. Just wash up the skeins or something. That’s to avoid a shrinkage problem later, maybe. Just my off hand thoughts about it… I look forward to seeing what will come from this! those dummies are interesting- clever if a bit odd. I ‘d love to see IT in action, as in wearing a top? Would ‘why’ be an appropriate question? Actually I once had a similar experience but paid good money for it. It was called a de-tox & also involved mud! The thought of seeing one of those dummies in action is a bit frightening. Too ‘Night of the Living Dead’. But you’re right, it would be a very good idea to put a top I wear on it to see if it looks as I think it looks on me. ‘Why’ is a very reasonable question 🙂 The idea is to make a reasonably accurate replica of me on which/to which I can ‘fit’ knitted garments. It’s much easier to check fit and drape objectively as you walk around a dummy wearing the garment. Alas, I can’t be both dummy and observer, as we have only two mirrors in the house, neither of them anything like full-length. What a very useful tool to have. You look great in it, by the way! And it sounds like such fun. I always say this: I must try it out some time.It sounds like an interesting chat you had with M. I bet I’d have learnt a lot from it!